As we left Greatstone, two youths trundled onto the beach where it had been exposed by the receding tide. One of them pulled a home-made cart behind him, consisting of a plastic crate fastened to some pram wheels. The other carried a long pole. 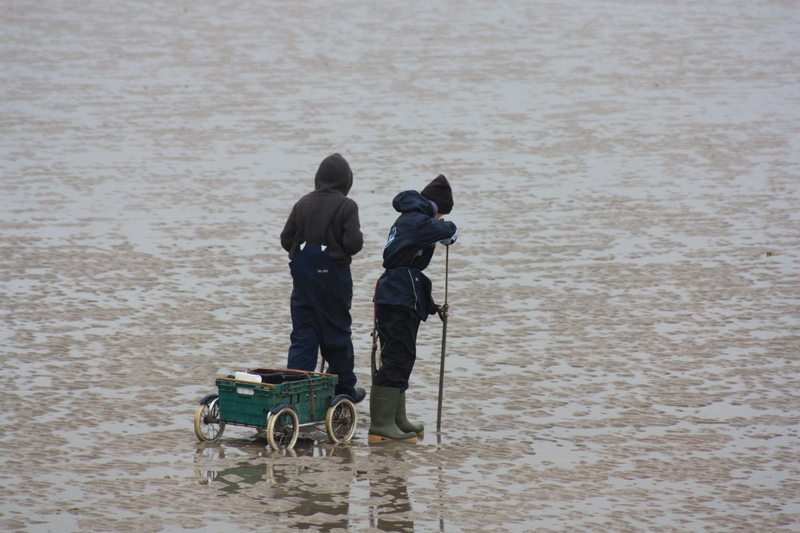 As we watched, the one carrying the pole stuck it purposefully into the sand. He then pulled the end he was holding, which retracted from the main shaft a bit like a bicycle pump. Obviously something was being sucked out of the sand, but what? Lugworms was my best guess. Slightly further south we reached the ruins of Lade Fort, an old fort constructed in 1798 during the Napoleonic threat. It was an octagonal fort, 215 meters in diameter, and armed with eight 24-pound guns mounted on top of its ramparts. There are conflicting reports as to its fate. Some sources say that in 1803 it was determined that the fort would not be able to survive a coup-de-main (an attack with the objective of capturing a position in a single, swift, action). They do not say whether or not it was decommissioned because of this. Other sources say that it was destroyed by the sea sometime between 1818-23, but still others suggest it was re-armed in 1860. Perhaps all of these things are true. Whatever its fate, today it lies in ruins, surrounded by a housing estate on three sides. 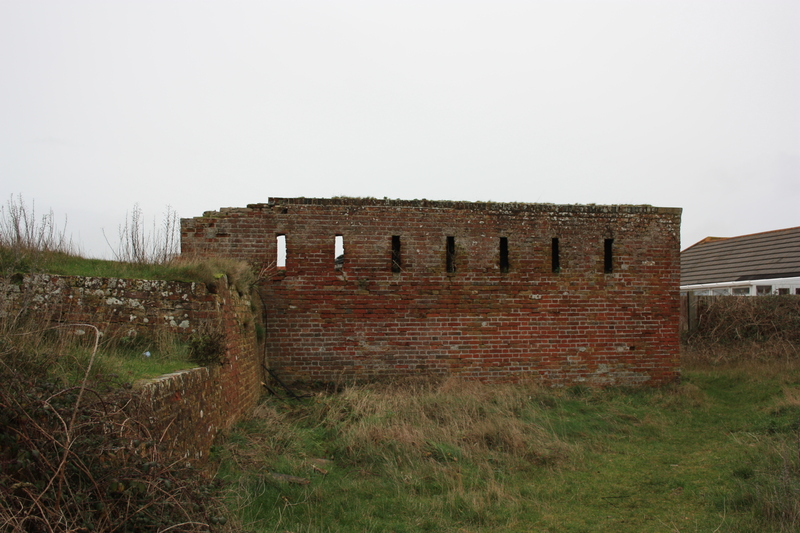 The fourth side lies open towards the sea; the ruins continue to search the horizon for the attack which, had it come, the fort could not have withstood. Running in front of the fort is the Romney, Hythe & Dymchurch railway line. This is a famous steam and diesel railway with a fleet of one-third scale engines, running all the way from Hythe to Dungeness. At Greatstone it runs directly behind the single row of houses that line the coast road. When we first arrived at Hythe a few weeks ago we were hoping to take a round trip, but in the Winter months the trains do not operate. I have heard that residents of Dungeness use the service daily to commute to work. What a commute that would be! 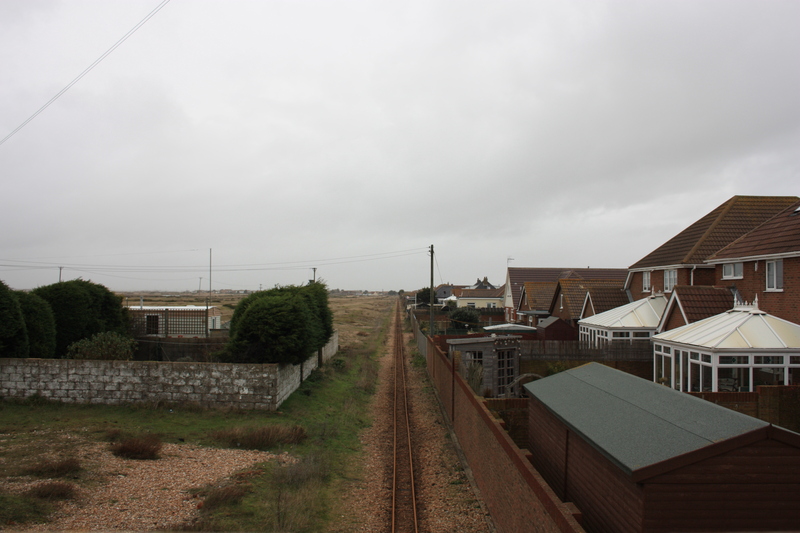 We went back to the seafront road and walked south, parallel to the railway, and into Dungeness. This entry was posted in Kent and tagged coast, fort, Greatstone, Kent, lugworms, Romney Hythe & Dymchurch Railway, travel, walking. Bookmark the permalink. I looked up lugworms. Ewwwwww.